Ahhh, yes. I will pretty much always like an Andrew Ries themeless, as he’s keen on running a staggered stack of long entries through the middle and using lively fill throughout. 70-worders (or 72s) aren’t supposed to be as difficult to construct as lower-word-count themelesses, but it’s hard to maximize the zippiness with a tougher grid. 18a. [Practice roster for an N.F.L. team], TAXI SQUAD. Didn’t really know the term. Was reading about Sweet Charity for work the other day and learned the old term, “taxi dancer.” Are there other taxi people besides taxi drivers and passengers? 20a. [Half of a 1980s sitcom duo], KATE. Weird clue given how largely forgotten the show is and how many other ways there are to clue KATE. At least when ALLIE is the entry, the options are limited. 32a. [Only facility in the world to have hosted the Olympics, Super Bowl and Final Four], GEORGIA DOME. Narrowed it down to Los Angeles, Salt Lake City (which lacks an NFL team) … and Atlanta. Boom. 47a. [Kind of pressure], SINUS. Sending light and love to our migraineurs who are affected by changes in barometric pressure. The SINUS pressure is only a fraction of the problem. 62a. [Excalibur’s place], VEGAS. And we had the casino ARIA the other day. I’ve got bad news for those of you who disapprove: There are Vegas casino names for most letters of the alphabet. 7d. [Ones sharing some shots], SNAPCHAT FRIENDS. My kid started college with a ready-made group of friends from a Snapchat group that had been chatting throughout the summer. This term is legit! 19d. [Celine Dion, by birth], QUEBECER. Also Quebecker or Québécois/Québécoise. 30d. [Deeply felt], SOULFUL. I like this. 38d. [Member of the Hoboken Four], SINATRA. Have never seen the term “Hoboken Four” before. 4.25 stars from me. An enjoyable solve from start to finish. This was fun! Kyle Dolan returns with a beautiful grid filled with lots of tasty goodness. The revealer at 132a is clued [Alphabet providing the “ingredients” of this puzzle’s soup]. I admit that that answer eluded me for almost the entire solve. Despite knowing the NATO alphabet, I didn’t recognize them in the theme answers. I think I was distracted by all the other good fill in the grid. Anyway, each theme answer starts with a letter from the NATO alphabet. Those are brilliant choices for theme answers. Each one is clean, solid, and incontestable. Kudos to Kyle for finding lively choices that fit symmetrically. But I will admit that when I finally uncovered the revealer, I felt a little let down. Each answer had a word that was also a NATO alphabet letter. So what? 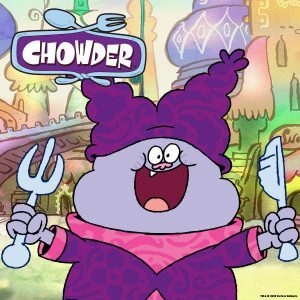 CHOWDER! A perfectly soupy conclusion to tie everything together. Fabulous! And that was on top of all the fun words and phrases Kyle managed to cram into the fill: LITERATI, AMEN AMEN, RATTLES ON, JOHN WOO, PLOWSHARE, CARE BEAR, HONEYDEW, ROCOCO, JAMAICA, HOOK NOSE, “SEARCH ME,” PROP JETS (though I wanted PROP JOBS), PLAY GAMES, TOOK A TURN, OVERTIME, and “SIR, NO SIR!” That’s really good stuff. I will admit (for the third time) that I got stuck in the middle. 27d [They offer deals on paper] looked like PRINTERS and right next door at 54d [Aquiline feature] was saying “HAWK NOSE” to me. And next door to that 65d [Political leader?] wanted NEO in my brain. That gave me MEA for 59a [Andy Warhol portrait subject] and RWNE for [Venetian magistrate]. I quickly corrected to HOOK NOSE, but that left me with MEO and RONE. Those didn’t seem right, but at least they were pronounceable. I should have known DOGE, so that’s all completely on me. A few other outlier entries raised my eyebrows. 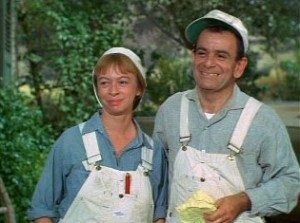 For example, MELTON [Sid of “Green Acres”]. That’s a deep cut. Once you get past Eddie Albert and Eva Gabor and Arnold the pig, I’m lost. Other entries that gave me pause: OREST [Baritone role in “Elektra”], LATEEN [Sail shaped like a right triangle], and BEYS [Ottoman governors]. 47a [River that ends at Cairo]. That feels like a new way to clue OHIO. 49a [Slip of the pen?]. ESCAPE. I didn’t get this until just now. “Pen” as in “penitentiary.” Nice. 60a [Second in a noble line?]. NEON. 7d [2008 compilation album that included “Acid Queen” and “Proud Mary”]. TINA. Misdirection here if you know the songs “Acid Queen” from The Who and “Proud Mary” from Creedence Clearwater Revival. Both songs were covered by TINA Turner. 123d [Driving stick?]. TEE. More good misdirection. 74d [Threads for when you’re hanging out in your crib?]. ONESIE. Ha! Overall, a lovely, fun, fresh-feeling puzzle with an a-ha-moment-delivering theme. 4.25 stars. Here’s TINA Turner absolutely owning “Proud Mary” in 1982. Let’s see John Fogerty do some of this! Have I solved a Ryan McCarty Saturday LAT before? I think so. Perhaps I should keep some sort of database, but that requires too much work. Maybe someone already has one? Anyway, I am sorry that the constructors name isn’t readily familiar to me, but it does ring a bell. 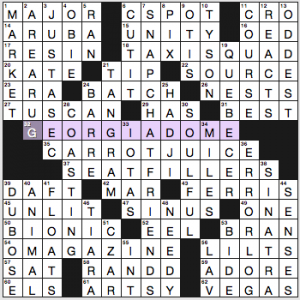 That doesn’t detract from the fact that this is a great 66-word puzzle that I really enjoyed. The stacks crossing in the middle are quite impressive. 4.8 stars from me for this awesome grid! 1A [Way to get up in Gotham] BAT ROPE – You knew it was BAT something! 20A [Activewear shoe brand] AVIA – OK: do they still sell these?? I NEVER see them anywhere! 30A [2014 title role for Mia Wasikowska] MADAME BOVARY – This would have been hard enough if the clue referenced her starring role in 2010s Alice in Wonderland with Johnny Depp! I didn’t see either movie, and I don’t know who this is. Perhaps it is just me! 34A [Where some get sloshed at sea?] BOOZE CRUISES – Best entry in the puzzle! I am going on a cruise in February, but I will definitely NOT be sloshed! 43A [Minolta Maxxum, e.g.] SLR – I still am going to buy one of these someday! 12D [League’s best] ALL-STARS – Strangely, in the NFL they are called Pro Bowlers. They are almost never referred to as “all-stars.” Still a fair clue. 26D [Smiley formerly of PBS] TAVIS – He was on BET years ago, too, I believe. I think he got caught up in the MeToo movement, probably justifiably, and may find it hard to recover. Perhaps watching OTHER people solve, like in the case of watching the geniuses solve these with downs only, is helping my solving! This one didn’t seem too horrible, although it is a Longo and is, in fact, truly a Stumper. But then, I think I have been slowly improving on Frank’s Stumpers for a while now. Perhaps after 3-4 years of blogging these I have finally figured out how he thinks! A solid 4.4 stars for another Longo gem, and I am curious to see how the Twitch solvers handle this one! 18A [Vanilla-flavored sweet stuff] CREAM SODAS – I don’t drink pop hardly at all these days, but a good cream soda is still delicious. A&W makes a good one, and there are some good off brands that are great as well. RED cream soda? A big no from me. 34A What shades might be considered for] LIGHTING FIXTURE – Great clue. Totally fooled me. This might actually be my favorite of the puzzle. 60A [1990s Page One novelty] COLOR PHOTO – Is “Page One” a British tabloid thing? I would think newspapers here had color front pages before this decade, but I could be wrong. 63A [Atlanta suburb] ALPHARETTA – The company I work for has a job near here. Perhaps I will get to go visit soon! 2D [Newborn evaluation test creator] APGAR – I thought for years this was an acronym! 5D [Anti-caking garlic powder additive] RICE – Who knew? 10D [Heavy wind] BASS SAX – I had ALTO SAX in here, but that isn’t really heavy, is it? 34D [Home of the Mekong’s “4,000 Islands”] LAOS – I am going to reference Ken Burns’ The Vietnam War documentary again, as there were several references to escape routes through Laos. Parts of the Ho Chi Minh trail went this way. I feel like I don’t know hardly anything about this part of the world. 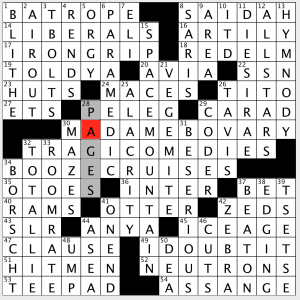 58D [It means “billionth of a billionth”] ATTO – This seems crossword friendly; I am surprised I don’t see it more often! This entry was posted in Daily Puzzles and tagged Andrew J. Ries, Frank Longo, Kyle Dolan, Ryan McCarty. Bookmark the permalink. Great puzzle. I had it as a 4.5. I’ve looked at many error logs in my time and while it’s true they contain a list of errors I’ve never heard it referred to as a list. That being said, you would read it into a List Object in the Java Programming language if you were going to manipulate or search it programmatically. Didn’t know what a tangram was, cool thing to learn. I’ll always associate Sid Melton with Icky Mudd, Captain Midnight’s sidekick. For you whippersnappers, Captain Midnight was as good as TV got in 1955, the year we got our first set. The show and the character was renamed “Jet Jackson” in syndication due to copyright disputes. They just dubbed Jet Jackson over Captain Midnight whenever the name was part of the dialog. Elaine only knew it as Jet Jackson and I only knew it as Captain Midnight and we were arguing about which early show was better. It took a while before we realized we were talking about the same show. It shouldn’t have taken that long. How may lantern-jawed jet pilot special agents with a short Jewish sidekick from Brooklyn could there be? Elaine always wondered why everybody mumbled Jet Jackson’s name. I kind of snickered at the “in the world” part of the GEORGIA DOME clue. Take that, other countries! Your venues have never hosted any Final Fours! Haha! Nor any Super Bowls! I can’t tell you how confused I was as a kid about the term “World Series”. I could only conclude that baseball in America was so superior that no other countries could qualify. Awesome Saturday puzzle, fun throughout the whole grid with no crap! Not surprised, b/c the Aries subscription puzzles are also generally awesome. 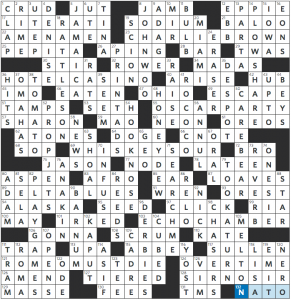 LAT: Great puzzle! I got stuck at TAVIS/TITO, but the rest was smooth and lovely. I had BATHOOK for 1A but soon figured out that was wrong. But as Derek said, I knew it was BAT-something. Thanks for the breakfast entertainment. NYT: Also smooth and lovely. This was a nice Saturday solve, thanks! Yep, LAT was great. “Offers?” is a great clue. “OFFERS” – my favorite in the whole puzzle. “ZEDS” was at the bottom of the list. I don’t like those self-referential word clues. They nail me every time – maybe it’s just a self-esteem thing. Also extremely easy for me, unlike yesterday’s. Great puzzle. 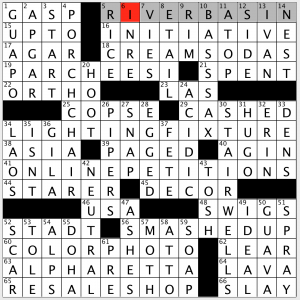 Enjoyed the several sports references, the most we have had recently in a puzzle. The WSJ was more challenging and rewarding actually. First time doing a WSJ puzzle as I had thought that they charged for it. It had a very good revealer of which I didn’t fully understand until reading Jim’s review. I found today’s NYT a tad harder than yesterday’s — mainly because of the top middle bit — TAXISQUAD, the SNAPCHAT part of the long down, CUTIT didn’t spring to mind quickly. The Stumper was fairly straightforward — my only problem was BASSOON instead of BASSSAX, which took a while to untangle. I was puzzled by the clue for STADT — why spell München in German but Cologne in English? In fact it’s a backronym, so you’re not entirely wrong. Wow – never knew that! When I learned the word, I knew it as having been named for Virginia Apgar (full disclosure – had to look up her first name just now). I also knew that it sounded like it should be an acronym, but since I knew it to be other than that I never bothered to look. Also love the word “Backronym”. LAT was 5 stars for me. Really enjoyed it. I posted a question on reddit but haven’t gotten any responses yet, so I’ll post it here too, since so many puzzle folks frequent this blog. Those of you who compete in tournaments but typically solve electronically: how did you make the transition to pen and paper? I’ve gotten very fast in Across Lite — I smoked today’s NYT in 4:13 (which I couldn’t believe when I looked at the timer). But so much of that comes from the advantages of solving with keyboard and screen. Someday I might get brave enough to compete in a tournament. What tips and tricks do you have for (a) moving from the computer to pen and paper and (b) maintaining your speed while doing so? any explanation or help appreciated!! Dodge’s model line of pickup trucks is Ram, although it may have been spun off as its own make? That’s the gist anyway.